Award winning master crocheter Drew Emborsky, aka The Crochet Dude®: has quickly established himself as one of the hardest working success stories in the industry today. Drew's quirky title as "The Crochet Dude" and his kitschy tongue-in-cheek designs have propelled him from a young, unknown fiber artist to the cutting edge of the fiber design world. His books, tv show, line of products, and online fan-base continue to grow and flourish making him a much sought after instructor. Drew Emborsky calls Houston, Texas home where he lives with his two cats, Chandler and Cleocatra. Drew became known as The Crochet Dude while working with a charity group after the passing of his mother. His time with the group eventually led to the launch of his popular blog with the same name, which led to the publication of his patterns and guest appearances on HGTV and the DIY Network. 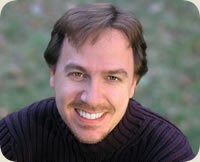 Drew has served on the board of directors of the Crochet Guild of America (CGOA). He has been featured in national publications including BUST Magazine, Interweave Crochet, Knit.1, Crochet Today!, Studio Magazine, Where Women Create, as well as international newspapers like The Sunday Telegraph (in London). Fans also know Drew as the crochet expert for five seasons on the hit show Knit & Crochet Now; watch for new episodes airing now on PBS! Breaking News! Drew Emborsky has been cast as a regular on the hit show Knit & Crochet Today as the “crochet expert”; watch for him in seasons 3 & 4 now on PBS! Drew Emborsky studied fine art at Kendall College of Art & Design in Grand Rapids, Michigan.